Lock and key systems may be more inefficient security measures than you realize. Anyone who has ever been in charge of a physical security system for a building has likely been frustrated with traditional lock and key systems. Perhaps you’ve even explored a few of the latest and greatest alternatives but are limited by budget restrictions. What you may not realize is how much of a return on investment you get on a modern access control system. Below are a few ways that traditional lock and key systems may be hurting your business and why switching to an access control system could be hugely beneficial. 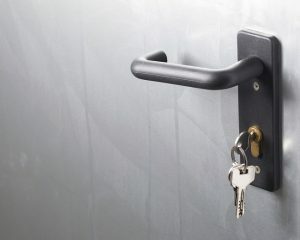 If you’ve had to rekey your office before, you’re already aware of how expensive it can be, not to mention making arrangements and waiting for the professional locksmith.. This, combined with how often turnover can occur in any business, means that you may be spending more time and money than is advisable to reconfigure all of your locks. Access control systems just rely on you to keep a database updated, not a physical lock that needs to be changed out in a costly way. Employee theft can, unfortunately, be a significant contributor to inventory loss. This is in part due to the nature of keys: it’s difficult to track who has what key and when that key is used. In contrast, access control systems can be checked to see who was where and at what time. This can be combined with video surveillance CCTV systems to monitor entry and exit points as well, furthering your efforts in deterring theft. It may not be the most obvious effect of having standard lock and key systems, but how much time do you spend per month unlocking doors for someone who forgot their keys? Or unlocking doors for temporary vendors or maintenance repair people? This may be a sign you’re inefficiently using your time, wasting money on costly payroll expenses that should be allocated towards higher priorities than opening doors. This entry was posted on Friday, June 8th, 2018	at 10:20 am	. You can follow any responses to this entry through the RSS 2.0 feed. Both comments and pings are currently closed.